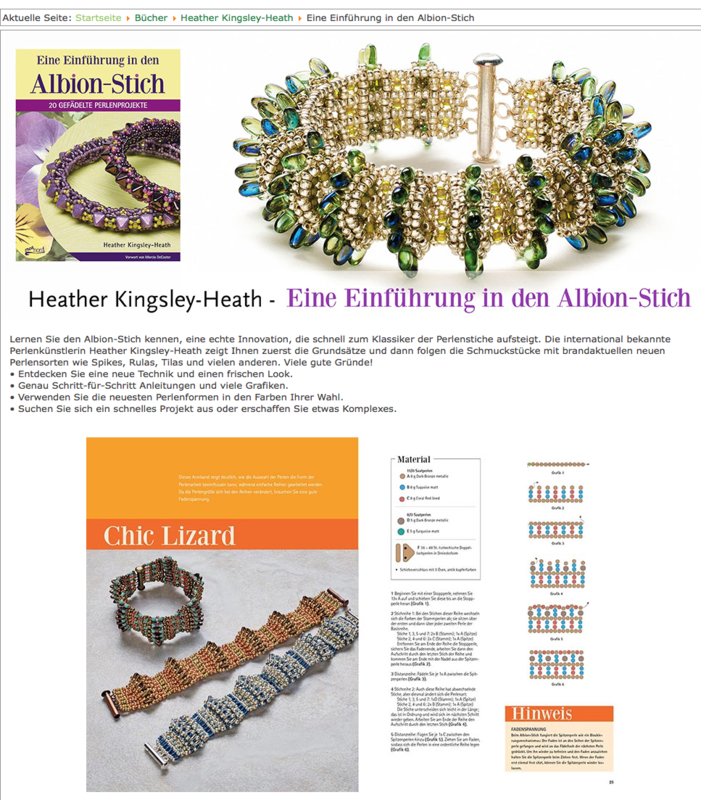 I’m thrilled to have Introducing Albion Stitch translated into German by Claudia and the lovely team at Creanon.de I’m also loving how pretty they have made my book page look. 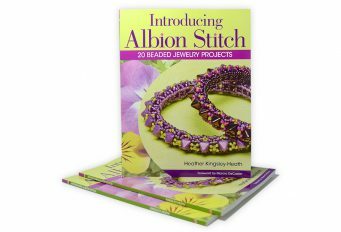 It has been a long time in the development but I’m so excited to share with you a new Albion Stitch book, published by Kalmbach Books in the USA. I’ve had such fun working with the team. The excitement is definitely mounting here as we count down the days until it is published. In the world of stitching “new” stitches tend to be variations of old favourites, and truly new stitches are extremely rare. 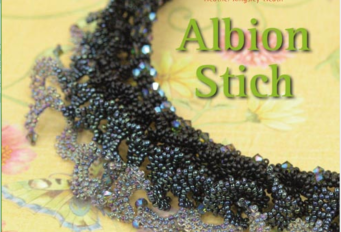 In Introducing Albion Stitch, Heather Kingsley-Heath teaches bead stitchers her own Albion stitch, a new invention that can be used to create flat pieces, lacy designs, and stunning dimensional “ridged” pieces. 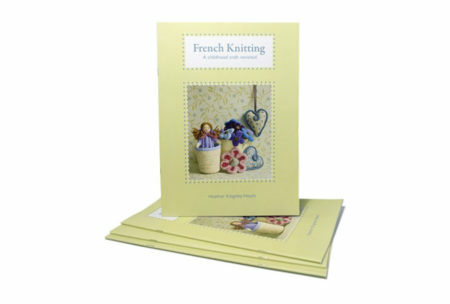 Beaders can use Albion stitch alongside their old favourite stitches to make 20 new projects. Heather’s designs use the latest bead shapes like spikes, gum drops, rula, tila, and others in the most popular colors. All the projects feature Heather’s playful sense of color and organic, dimensional designs. All of my books can be purchased via my shop page. Albion Stitch just got a whole lot bigger! I’m delighted to share the news… My friends at the German publishing house Creanon have chosen a selection of designs from books one and two and published ‘Albion Stich’ It is so exciting to see my work in another language and I love the way the team have presented the designs, with gorgeous new photography. In August I went to the Beaders Best show in Hamburg for the launch of the book and for a moment felt a little bit famous as I got to do book signings and pose for photographs with all the lovely beaders buying my book. If you’d like to buy the German language version just click here. 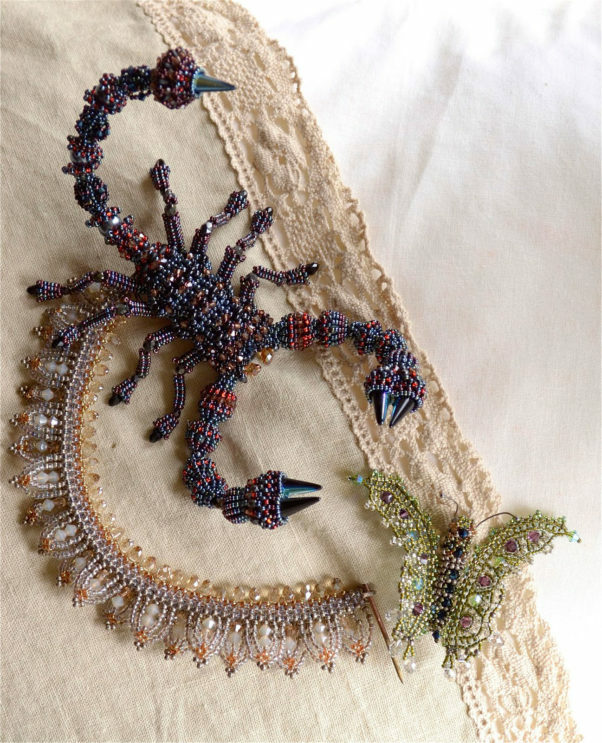 The Dragonfly first appeared as an exhibition piece for Swarovski London, and features in the gallery pages of Albion Stitch book two. 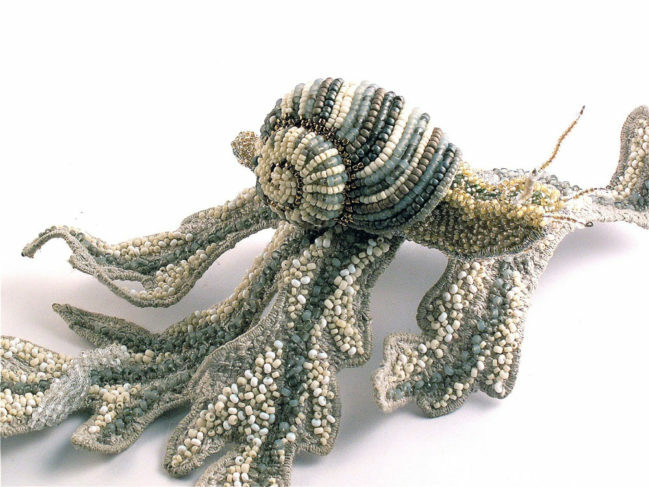 It also appeared in articles in Beadwork Magazine in the USA and Bead Magazine in the UK. As a result, a lot of requests for the pattern arrived in the inbox. The original was made without a workshop in mind, and used a lot of vintage bits from the bead box which I knew would probably not be widely available. So for the longest while I replied to those emails requesting the pattern with a polite thank you, but it can’t be done. Finally the penny did drop! I visited my favourite bead store to gather crystals and beads with which to re-work the design. I’ll be honest and admit that I wasn’t looking forward to the task of following the thread paths back through the original piece, but like most things that get put off, once you commit, it’s easier than anticipated. 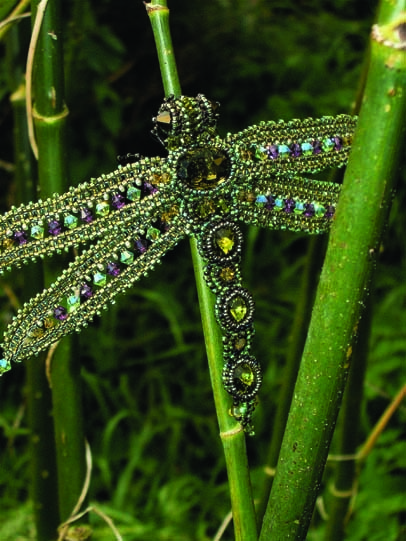 Dragonfly two was born, and to make sure everyone could access the beads and crystals if needed, a kit was born at the same time. Since then it has become one of the most popular designs and it is enchanting to see the many colour variations that get created. Dragonfly has been made to adorn wedding outfits and party frocks, as gifts and thank you’s; even as a set of several to make a sparkly mobile; but my favourite story is about the one made to decorate a parcel containing a fishing tackle box, a retirement present for a much loved colleague. Albion Stitch is one of the easiest ways to create a bezel. 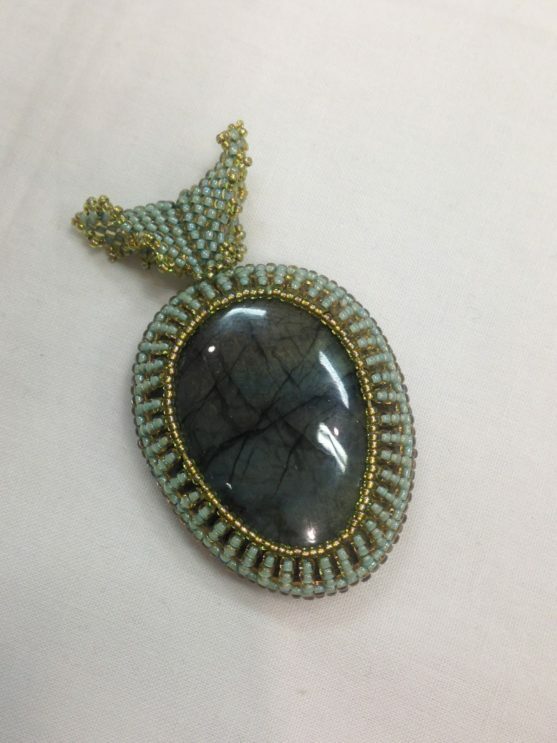 I was at a bead show when one of my lovely students, Lynn Gosling, brought this bezelled Laboradite cabochon to show me. She was full of enthusiasm about how easy it was to make the bezel fit a slightly uneven stone. I love her use of colour! There are lots of different ways to use Albion Stitch to create bezels, from simple ones to fit even stones, to variations which can accommodate the lumpiest of pieces and any number of corners. Lynn Gosling’s Albion stitch bezel. I also like the fact that you get to see a lot more of your focal stone using Albion Stitch, which is not always the case with other stitches. To date I’ve bezelled just about everything from buttons to cheap and cheerful plastic crystals. The visit from Lynn was timely as I’d just started the process of sorting out my cabochon stash with a promise to self to use them before being tempted to buy more (epic fail on that score!). This in turn, got me thinking about the many beaders I know who also have a collection of lovely stones in the ‘one day when’ box. As a result I have a new workshop almost ready to teach for the 2014 season. Designed to show and share how to bezel just about any shape, the ‘Sticks and Stones’ class will also take a long look at the beading techniques needed to create links and framing once the stones are bezelled. Perfect for beaders in need of the first steps into designing. A big thank you to Lynn for reminding me about this one lovely aspect of Albion Stitch. If I look back through my beading archive, and my textile archive from the days before the bead love got to me; I can see a pattern of figurative work. I love to create forms. The snail on an acanthus leaf, was made for the Beadworker’s Guild annual challenge, which had the title ‘Architectural aspects’. I loved the process of exploring the title, fell in love a little bit with Fibonacci and even more with the process of creating my entry. It’s a marriage of beading and textiles which I made over a two week period. I enjoy the research stage, the time of promise and possibilities. A few years later I applied the same process to the preparation of my ‘Battle of the Beadsmith’ entry in 2012. Against a field of international Beaders, I knew I wasn’t a giant necklace kind of designer, and calculated that ‘Pretty’ would be plentiful, so I opted for ‘Ugly’. My bead board looked like the autopsy scene from an Alien movie for the longest while. It was also tough to get up close and observational with scorpions. But it was the best fun. I also learned a lot about competition and the psychology of competing. I also found some new ways to play with Albion Stitch. I love the way the stitch can grow from any other beading technique; in the Scorpion figure it grows from Right Angle Weave, Herringbone stitch and Peyote Stitch, giving me a whole new range of combinations to play with. The flower section on the scorpion piece became a new design called Winterfleur. I think it is the ability of Albion Stitch to enable me to ‘draw’ with beads that I find most exciting to explore. For me, this figurative work is the work I love to do most, when time permits. it isn’t though, the easiest to break back down into easy to follow steps, it kind of ‘grows’ and there are only so many times you can describe a step as ‘fiddle ’til it fits’! I am though, working on new ‘nature inspired’ designs where the instructions will be a bit kinder to follow!